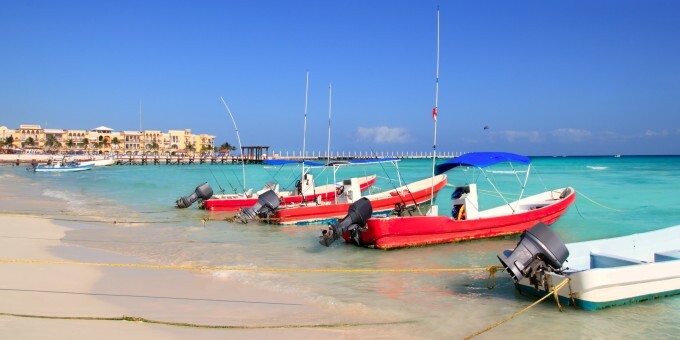 Playa del Carmen (often referred to as just “Playa” locally) was a little, unknown fishing village that was discovered by the traveler’s visiting Cancun and Cozumel and is now one of the fastest growing coastal towns in Mexico. Playa del Carmen offers you the enjoyment of a simple beach holiday without the trappings and characteristics of a modern-day commercialized resort like Cancun. The tourist developments here are low-rise, taking into account the local environment, and giving playa a more charismatic and authentic Mexican feel. This is contrast to the highly commercialized resort experience which is common in places like nearby Cancun. Playa del Carmen is quite a ‘young’ resort – in that it attracts a lot of people in the twenty to thirty-something age range. They come here looking for a comfortable holiday; to swim, sunbathe, stroll along the wonderful beaches, listen to bands playing in the open air, and dance at a club at night. The fine resort hotels, situated in Playa and along the rivera maya are some of the finest in Mexico. They offer first-class facilities, great amenities, world-class service and a perfect environment to enjoy a vacation. Some of the resorts are adult-only, and popular with people coming to Mexico for a honeymoon. Many others are family-oriented, and are hugely popular for family vacations, especially during the Easter and Summer holidays as well as Christmas and New Year. Playa has some excellent boutique craft shops that will offer you the opportunity to buy something quite unique to take home with you. See the section on what to buy in Playa del Carmen for details. A definite advantage of Playa del Carmen is its geographical location: It is close to Cozumel, Cancun, and all of the fabulous archaeological parks in the area, so it makes an ideal base if you want to visit all of the main towns and resorts in this part of Mexico. There are also a number of eco and adventure tourism options to opt for – see Key Attractions for details. Playa del Carmen is also part of the famous Riviera Maya – a stretch of towns and villages situated along beautiful beaches which extend from the southern edges of Cancun as far south as Tulum. You can read about the Riviera Maya in Key Attractions on this guide and also browse hotels, resorts and spas in the Riviera Maya region here on Mexperience. Playa del Carmen today is a relaxing place – if you want to unwind, then this region of Mexico will make an ideal location for you. Choose Playa del Carmen when you want peace and tranquility on a beach sunbathing; or to take quiet strolls along soft, white sands with the cool waters of the Caribbean lapping your feet. Playa del Carmen is one of Mexico’s top destinations for Sports Fishing – especially deep sea fishing! Read the Mexperience guide to Sports Fishing in Mexico and discover just what a fantastic day out a sports fishing experience can be on your next visit to Mexico. Divers and people who want to snorkel come to Playa del Carmen to enjoy the great waters and excellent diving conditions. You can swim with the Dolphins on Isla Mujeres. Connect to the guide to Swimming with Dolphins in Mexico for details. Sports Fishing and Kayak rental are the two other main activities people enjoy during a visit to Playa del Carmen. Connect to the guide to Watersports in Mexico for details. Playa del Carmen and The Riviera Maya (see below) are host to some excellent Resort Spas. For more information about Spa experiences, and how to benefit from a magnificent health spa experience, connect to the Mexperience guide to Spas in Mexico. Nearby Playa del Carmen you’ll find an extensive choice of Maya ancient cities, converted into archaeology parks open to the public. Nearby parks include Tulum, which overlooks the turquoise Mexican Caribbean, Coba, and Chichen Itza, voted as one of the “new wonders” of the world. The 125km stretch of coastline that stretches from the southern edge of the resort town of Cancun, through Playa del Carmen and the Mayan Ruins of Tulum, finishing at the Sian Ka’an Biosphere, is known as the Rivera Maya. Puerto Morelos – as yet an undeveloped quiet village, perfect for a break away from the crowds and commercialism surrounding Cancun. Akumal – one of the least commercialized areas of this coastline, Akumal offers the perfect place to relax away from the hype and bustle of Cancun and other commercially developed areas. The location has a high number of holiday houses for rent, making it a popular place for families and couples who want to enjoy the experience and economy of a self-catering rental holiday. Sian Ka’an Biosphere is located between Tulum and Akumal and is a federally protected reserve that features freshwater canals, tropical forests, mangrove wetlands, lagoons, prairies and a 70-mile long barrier reef – the second largest barrier reef in the world. Costa Maya – the area south of the Sia Ka’an Biosphere to the coast off Belize. The area holds attractions for SCUBA divers and sports fishing, although the beaches themselves are not as attractive as the ones further up the coast if you’re looking for swimming, bathing and strolling opportunities. By Air – Playa del Carmen has an airstrip that handles small charter aircraft and private air taxis. AeroCaribe, the main local small aircraft operator, has an office near the airstrip. For detailed information about flights and flying, see the Mexperience guide to Air Travel in Mexico. By Bus – Local buses and suburban vans carrying holiday makers and their luggage comfortably, travel from Cancun to Playa del Carmen and back daily on a regular basis. The suburban vans “Collectivos” are white and offer excellent value for money, carrying up to 10 passengers and their luggage comfortably for just a few dollars each. You can board them from their base near the bus stations at both Cancun and Playa del Carmen. Long distance buses connect Cancun with Merida, all main sities on the Yucatan Peninsula, Chiapas, the Gulf Coast and Mexico City. For detailed information about bus transportation read the Mexperience guide to Bus Travel in Mexico. By Car – You can drive to Playa del Carmen from Cancun by taking Highway 307. See additional information about Driving in Mexico and Mexico’s Toll Roads on Mexperience. Car Rental – To explore Mexico’s provincial towns and cities — including its beach locations and the scenery and attractions near them — consider renting a car for your visit. Having your own car will give you more flexibility than using public transport options and, in some cases, offer you access to places which are otherwise difficult to visit without the use of a car. 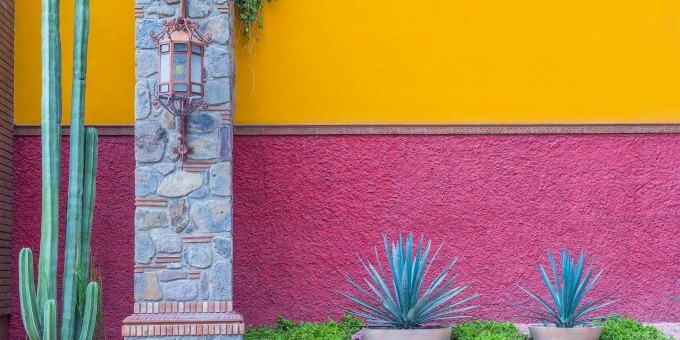 Read our guide to Car Rental in Mexico to learn what you need to know about car rental in Mexico and connect to the Mexperience Travel Center to reserve your Rental Car. Tricycle Taxis – In certain areas of town, only tricycle taxis are allowed. They will take you and your luggage very efficiently to your hotel, or to the ferry that crosses to Cozumel. On Foot – Most of Playa del Carmen is accessible on foot; and for exploring the local area, walking around is by far the best way to experience Playa del Carmen. No local events recorded at this time. Exchanging Currency: Most of Playa del Carmen’s banks with ATM machines are found downtown on Avenida 5. During business hours, they and the Casas de Cambio will buy traveler’s checks and cash from you as well. For detailed information about exchanging and managing your money, read the Mexperience guide to Money in Mexico. We have no specific restaurant recommendations at this time. Playa del Carmen stays awake until about midnight, with a few bars staying open later. There are plenty of restaurants and bars in town that offer good dining, and some night spots which provide live music and dancing for those looking for some active night life. Playa del Carmen is a good place to buy arts and crafts and unique curios that you will not find elsewhere. There is a selection of shops in town around the main plaza. In recent years, the art and craft outlets have been raising their game; they are now offering tourists fine examples of locally and and nationally produced, hand crafted works; effectively undergoing a transition from being tourist craft outlets into specialist craft boutiques. The climate in Playa del Carmen is very much like that of Cancun: Hot and humid, but the humidity is not as drenching as it can be in some other places in Mexico. August through October is hurricane season in this part of the world – and the weather becomes more changeable and less predictable during these months. The rainy season is May through October. November through February is the high season on the Riviera Maya, and the weather remains quite hot during these times, which attracts many “snow birds” from northern USA and Canada and Western Europe for winter warmth and sunshine.